James O'Barr - James O'Barr is an accomplished artist and writer, best known for creating The Crow.In 1978, O'Barr's fiancée, Beverly, was killed by a drunk driver, and he joined the Marines in an effort to cope with the loss. He was stationed in Germany and illustrated combat manuals for the military. While living in Berlin in 1981, O'Barr began work on The Crow as a means of dealing with his personal tragedy. O'Barr was further inspired by a Detroit newspaper account of the murder of a young couple over a $20 engagement ring. After his discharge from the Marines, O'Barr continued his painting and illustration as well as doing lots of odd jobs, including working for a Detroit body shop. The Crow sat on a shelf for seven years, but at last someone wanted to publish it: Gary Reed of Caliber Press. In The Crow, the protagonist and his fiancée are murdered by a gang of criminals. He then returns from the dead to hunt their killers.O'Barr's own hope that his project would result in a personal catharsis went unfulfilled, he told an interviewer in 1994, saying, "[A]s I drew each page, it made me more self-destructive, if anything.There is pure anger on each page". 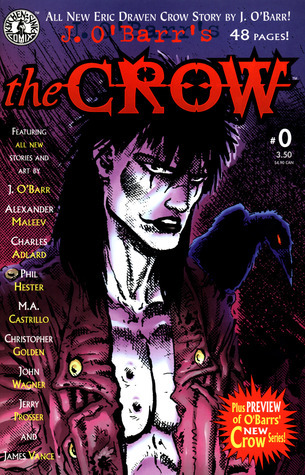 The Crow has sold more than 750,000 copies worldwide.The book was adapted into a successful film of the same name in 1994, but it resulted in further tragedy. Brandon Lee, who played the main character, was accidentally shot and killed during filming.O'Barr was the second American to be awarded the "Storyteller Award" by the International Comic Festival held annually in Angoulême, France.